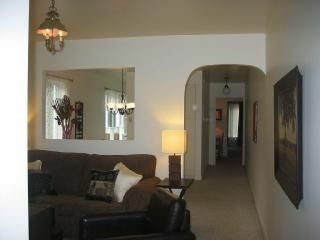 Apartment, 1Bedroom, 1 Bath, 4 Sleeps : 1400$ per month for 3 months and more. Premiers and many restaurants with terraces and a little walk from Old Quebec but, without the noise and crowd! The apartment is large,it is located at the second floor of a building counting six apartments. There is one bedroom with a queen bed,a double sofa bed,a large balcony with patio furniture, cable, a kitchen fully equipped, diner room, a living room and a study. Linens,free laundry are also included. PETS OR SMOKERS ARE NOT ALLOWED. READ ALL THE REWIEWS: Stephen: Many thanks for all your help - we had a wonderful time in Quebec city and the apartment was terrific! VICTORIA, BC. Michael and family: Thanks for everything, we had a great time and the apartment was huge and perfectly well equipped. NEW-YORK city, NY. Cora: We had a lovely time in Québec and the apartment was so convenient. Thanks again for the use of your lovely apartment. VICTORIA, BC. Bev and Kev: Merci beaucoup!!! C'était parfait. Nous voulons retourner. Thanks for the hospitality + privacy. RED DEAR, AB. Irene, Jen and Diana: We enjoyed our stay and appreciateed your lovely and well equiped apartment. It's been fun to be here to celebrate Quebec's 400th. We look forward to another visit and will certainly think of retourning to stay here. Meci beaucoup. Irene RIO DE JANERIO, BRAZIL, Jen and Diana WASHINGTON DC, USA. Mark and Nancy: Merci beaucoup Lucille! The accommodations are perfect for long walks to the walled city, museums and restaurants. We will certainly share your informations and will return to Quebec city. ST-PAUL MN. Eileen and Pat: We enjoyed our stay in your apartment. Thank you for everything you do to make your guests comfortable. Quebec city is a fabulous town and it was easy to get anywhere from here on the buses. CALIFORNIA. Gail and Ben: Thank you so much for sharing your lovely apartment with us! We have enjoyed being in your neighberhood! It was nice to see how everyone lives here! We enjoyed shopping qt the grocery store, riding the Metro Bus and being a part ofthe locals! We loved Quebec City ans all the sights. GEORGIA. Richard: Thanks Lucille! Wonderfull apartment, really loved to stay. NEW-BEDFORD MA. My sister and I stayed in this lovely apartment in August 2015, and while we found it well appointed, very clean (partly because you are expected to clean the bathroom yourself before you leave, so the last tenants would have done that for us?) and centrally located, the noise from the traffic on the street was truly excessive. Because a nearby through street was closed during most of our stay, huge trucks came along our street from early morning until late in the evening. What's worse, the apartment is on a corner with a stop sign, so all the trucks had to come to a complete stop, sometimes with air brakes, and then roar the engines to get going again. And although the truck traffic might have been temporary, almost as noisy were the double-length buses that drove along the street from before 6:00 a.m. until after 10:00 p.m. – and they do that all the time as evidenced by the large bus shelter at the end of the street. If you’re sitting on the balcony, you have to pause any conversation until after the buses have gone by. The apartment’s other significant drawback for us was that the only bathroom is accessed only from the bedroom, which is a nuisance for the person sleeping on the pull-out couch in the living room. To use the bathroom in the night, you have to go through the bedroom because there’s no other way to get there. That’s not a problem for a nuclear family, perhaps, but it’s far from ideal for any other configuration of visitors. This apartment might be more suitable for winter stays when the windows are tightly closed – or for people who are hard of hearing, perhaps. Honestly, I do not understand what is your interest to focus so much, in a review, on a temporary noisy situation, caused by major works in the neighbourhood. It is the same for the busses that had to take a different circuit during the repairs. Regarding the cleaning, don't worry, I do all the cleaning by myself, including the whole bathroom. It is not the last tenants who cleaned your bathroom. I only ask people to make a minimum cleaning of their toilet, by respect for the person who will clean their apartment. That is why I provide cleaning products. I do personnally the same when I rent apartments via Vacation Rentals or other same organisations. I also provided to you a free parking that I had to deal with one of my tenant to accommodate you, wich is not included with the apartement. But, you didn't respect the place designated, so you'ved cause me a problem with another tenant. And, about the access to the bathroom through the bedroom, nobody ever complained about that. It is certainly not worst than sleeping in an hotel room. Finally and once again, what is your interest, and how could your review can inform people, when you complain about a temporary situation. I had tenants all the summer long, starting in May, and no complain at all, only very good comments. You know, you don't have to write a review, especially if it is to complain of a temporary situation, out of my control. My wife and i loved the quiet, safe and convenient neighborhood. Large and very central to walking anywhere in the city. Very large and cool in summer with perfect little balcony to sit and watch people.....absolutely nothing bad to say....visited aug of 2008,not per calender on this site. Quebec is the closest thing to a european holiday in canada....but better. Thanks so much for your assessement. I have a really good calendar this summer and I am sure that all you said about the apartment and the area counts very much. I really hope that you will come again. Il n’y a pas d’espace de stationnement prévu avec l’appartement. There is no parking space with the apartment. À votre départ, s.v.p. laissez les clés dans le vase sur la console à l’entrée. After your stay, please leave de keys in the vase in the entrance. La literie pour le sofa lit se trouve dans le coffre devant celui-ci. Linens for the hided bed are in the chest in front. La salle de lavage se trouve au bas de l’immeuble: Vous utilisez l’escalier gris et elle se trouve à la porte #1 (porte verte). La clé ouvre la serrure de la poignée. L’utilisation des appareils est gratuite, cependant, vous devez avoir votre savon et respecter l’horaire d’utilisation (entre 9 :00h et 20 :00h en semaine et entre 10 :00h et 17 :00, la fin de semaine). The laundry room is downstairs: Use the grey stairs and this is behind the door #1 (green door). The key works in the handle. The laundry is free but you must have your soap and respect hours of operation (between 9:00h and 20:00h during the week and between 10:00h and 17:00h the weekend). Vous trouverez en haut de la rue, sur le boulevard René-Levesque, une épicerie, deux (2) pharmacies, un vidéo-club et une station de services avec accommodation. You will find just up the street, on Boulevard René-Levesque a grocery, two (2) pharmacies a video club and a gas station with a convenient store. Aussi, en haut de la rue, des tennis où vous pouvez jouer gratuitement et un terrain de jeux. Also, up the street, a free tennis club and a playground. Sur le chemin Sainte-Foy, seulement un bloc plus bas, vous trouverez un hôpital. On chemin Ste-Foy, just a corner down the street, you will find an hospital. Vous avez un YWCA à proximité et la piscine intérieure Lucien-Borne. You have a YWCA and Lucien-Borne indoor pool very close. Vacation rental rates: 0000,00$ CAD per month. 2000$ from June to October except if more than 3 months: 1400$ 1700$ from October to June A security deposit of 400,00$USD/CAD refundable after inspection. Note: Until confirmed, rates are subject to change without notice and for 4 people renting.